Forest Measurements cover by Open Oregon Educational Resources is under a CC BY 4.0 license (https://creativecommons.org/licenses/by/4.0/). 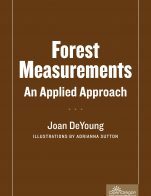 Forest Measurements: An Applied Approach by Joan DeYoung, Mt. Hood Community College, OpenOregon is licensed under a Creative Commons Attribution 4.0 International License, except where otherwise noted. 1. Section 1.3 - I found some of the concepts show a bit under developed. For example in the slope section it jumps right into scale and converting map distance to horizontal distance. I think this concept could be much more elaborated on as it is one that students tend to struggle with. 3. Section 2.8 Nice examples. I liked that there were a few of each. Even more would be better to allow more practice for the students. 4. Section 3.5 I didn’t find these questions very helpful or useful. If they were a printout or somehow interactive it would be better. I know there are interactive plugins for open textbooks that would make this more interesting. Another option would be pictures showing a tape showing around a tree and they need to record the answers. 6. Section 4.4 – Might be useful to define/show what evenaged and unevenaged actually are. These terms are shown in bold in the document but there are no links or extra info for people. Also this section is the only one I have noticed where the terms are in bold. For consistency all terms should be in bold (or not). Perhaps have them in bold and a link to a glossary/appendix? 7. Section 6.3 – It is mentioned that lower index numbers mean poorer sites, but it might also be good to mention that lower site classes indicate richer sites. Glossary - I found it difficult to know which terms would be in the glossary as only some of them were bold. I also didn’t even realize there was a glossary until I was almost done the review. It would be great to mention it in the intro and have hyperlinks on the words that take you to the term in the glossary. 1. Section 1.4 Question 2 – Although using the Pythagorean theorem does work to solve the question, this is not how it tends to actually be done in the field. I would use the technique where SD = desired HD/cos(tan-1 %S) so in the case of the example it would be SD=100/cos(tan-1 0.6) and the answer would be 116.6 feet. I mention this in particular since this is intended to be a text to train field techs and this is how they would likely actually do it in real life. i.Overall the content was accurate though slightly different than the way we might conduct it here in the field in BC. It might be good to have more examples to indicate that there are other ways. Or I would be interested in teaming up or making a Canadian issue of this text. I did not notice any errors in the content. Some of the diagrams could use additional labeling to increase effectiveness. i. Forest measurements is thankfully one of those topics that has largely remained the same over the decades (trees don’t change all that much!). I think this book could be used well into the future (20+ years). It would be great to have more chapters on additional content topic areas. Section 2.3 - Overall I found this section quite good with excellent diagrams. However I found the math to be a bit different than the way we do it here. I always change the %slopes into decimals so that I don’t have to divide the final answer by 100. For example VD= HD * (S% in decimals) So in the figure 2.4 example it would be 50 * 1.24 = 62ft. I find this is the way we do it in the field so as to eliminate the extra step of dividing by 100. The less calculation steps in the field the better! Section 3.1 - Figure 3.1 looks very interesting but there are no numbers on the x axis. It would be helpful to show what the diameter classes were otherwise people can’t see how big the trees collected actually were compared to each other. Section 3.2 - Excellent diagrams. Very thorough. Figure 3.10 has a label using a term that was not discussed previously or in the book. The term catface should be defined for people or perhaps left out. i.Overall the writing style is quite clear and easy to read/understand. However there is some variability in the formatting (such as figure numbering, key terms in bold or not). I liked the use of figures but found that some could benefit from additional labeling or use of photographs to add to the line drawings. Also, additional examples for students to work through at the end of each chapter would be beneficial. i.Overall good consistency, but sometimes overlooks that certain terms may be unfamiliar to a novice audience. Section 1.2 – Figure 1.7 could have labels to increase clarity rather than or in addition to referencing a later chapter. Overall the text was in nice sized chapters and fairly well organized. I found there were a few times where a concept was referred to and explained later (such as evenaged and unevenaged) which I found a bit disruptive. Overall good flow of concepts. Some more basic concepts are not explained in the text (such as scale and how to use/calculate it) but are referred to. If we are assuming a novice audience it may be good to clarify things. Overall it was good but plain. I feel like the experience could be improved with the implementation of the various interactive plugins available in online textbooks. Such as interactive pictures, drawings or examples would be great. Also, as I previously mentioned: hyperlinks to terms and concepts would be good for navigation. The writing was easy to read and free of errors. Section 4.1 – Although I think this is overall a useful introduction, I find the examples slightly biased and very colonizer centric. Almost all of the examples are related to important milestones for white people. It would be beneficial to include other examples from Indigenous or non-white perspectives. Overall I think there could be greater diversity and inclusion in the text. Yes it is a useful text and I think very beneficial to have a more modern Forest Measurements text available for free online to students. We currently don’t have a textbook for our Measurements course and I think this could be a good reference for students, although I would appreciate a Canadian edition with metric units. I would consider adapting this book for our own measurements course.